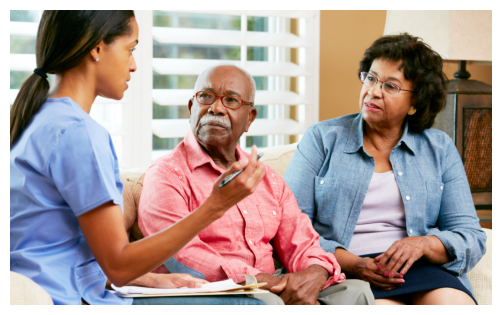 All home healthcare agencies are required to operate at the request of a doctor’s order. There are a couple of scenarios in which this can occur. Your primary care physician can evaluate you and send an order to us via U.S mail, Email, or Fax. After a short-term or long-term stay at a healthcare facility (hospital, nursing home, rehabilitation center, etc…) upon discharge, the staff at the facility will make a discharge plan of care for you. The staff should give you all the necessary prescriptions, supplies, and directions on follow-up visits. depending on the skill needed to help you, they may order home healthcare services for you. This allows you to continue being cared for in an environment that is more comfortable, your home! We understand the challenges that home-bound individuals face, it may not be easy to make your way to a doctor’s office. We can refer you to a visiting physician that makes “house calls”. We can also provide transportation for you to get to a doctor of your choosing, transportation services are complimentary. There is no guarantee that a doctor will order home healthcare services for you, that is a decision that only a doctor can make. Comfort Care cannot and will not attempt influence the decision of any doctor to assign services to individuals. Whatever the outcome, the transportation is free of charge to you! This process may seem long and tedious but, most of these steps take place behind the doors of our office and your doctor’s office. Emails, phone calls, and faxes the entire process can be completed in as little as 24-72hrs. After your doctor sends us an order stating you need home healthcare services, we will send a nurse to your home to evaluate you. The nurse will make an assessment, if he or she feels you need more or less than what the doctor ordered we will inform the doctor. We offer skilled nursing, home health aides, physical therapy, occupational therapy, speech therapy, and medical social workers. The next step will be you receiving your services, whatever combination that may be…..your nurses, therapists, and home health aides will all contact you to make appointments with you that fit into YOUR schedule. We will work with you until your goals are met. Keep in mind…. we offer skilled services, we employ licensed nurses, therapist, and social workers. Home healthcare is NOT meant to be long-term, this means that your goals should be separated by those that are short-term and long-term. Home healthcare can help you meet your immediate short-term goals, and give you and your loved ones the knowledge and guidance to overcome your long-term goals. You may not need skilled care as long as you think, we will create a plan that will include lifestyle changes…., sleeping habits, diet, exercise, etc…we will NEVER leave a patient who is in need. We have instituted programs to help our patients maintain and increase their quality of life, even after we discharge them. We provide these services to our patients complimentary as a way to continue to help and support them. Text “HEAL” to 555-888 from your mobile phone. To request home health care services call 773-221-4400. Or Click “contact us” . Or text the word “HEAL” to 555-888 from your mobile phone. Comfort Care Home Health Care looks forward to assisting you.